The capacitor microphone M 221 unifies universal small diaphragm capsule technology with a metal diaphragm and a modular preamplifier. 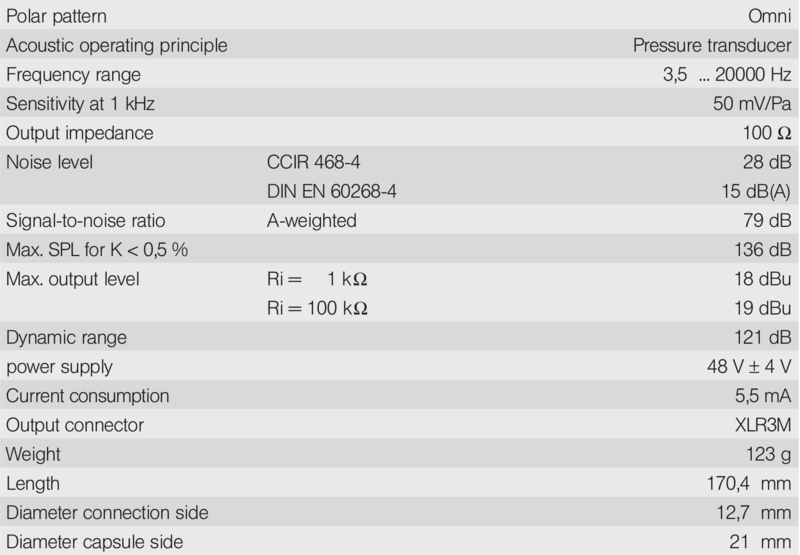 The use of a certificated measurement capsule combined with a preamplifier with 48 V phantom powering reaches a constant magnitude and phase response and transmission properties which are long-term stable. Because of the small capsule dimensions the M 221 is ideally suited for applications where a low interference with the sound field is demanded. It is usable as a main microphone for recordings which should include a certain amount of the room response. 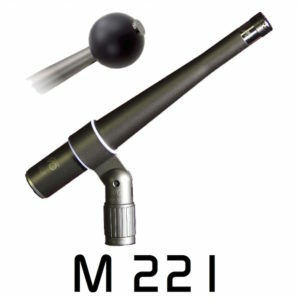 As well the M 221 is suited as a spot microphone for recording instruments very close where the low frequencies should be transmitted in detail and original. Moreover it can be used for multi-channel main microphone arrangements like AB stereophony or Decca Tree. For these applications the microphone is ideal because of its precise and long-time stable transmission properties. The M 221 has an excellent transient response because of the pressure transducer capsule and is really suitable to record instruments with extreme transients. With the both different sized APE spheres a high frequency accentuation can be produced in an acoustical way to increase the presence and to compensate the high frequency roll-off in the diffuse sound field. The capsule’s frequency response goes down to 3.5Hz (-2dB) – with the phantom powered body the lowest useable bass frequency would be about 10Hz. The pick-up pattern is equivalent to the longitudinal direction of the microphone. As sound transducer a condenser capsule with a diameter of 12.5 mm and a very thin metal diaphragm is used. The pressure transducer capsule exhibits an omni-directional polar pattern without proximity effect. 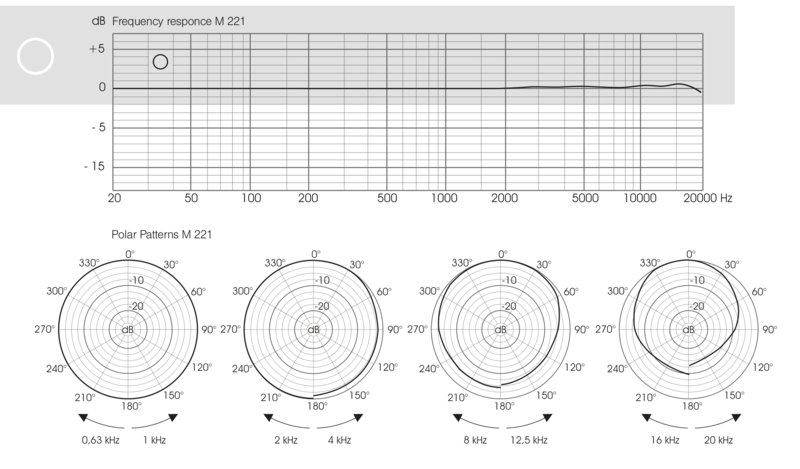 Because of the free field equalization the M 221 has a constant frequency response from 3.5 Hz up to 20 kHz (± 2 dB). The static pressure equalization between the capsule interior and the atmosphere goes through a vent to the preamplifier. 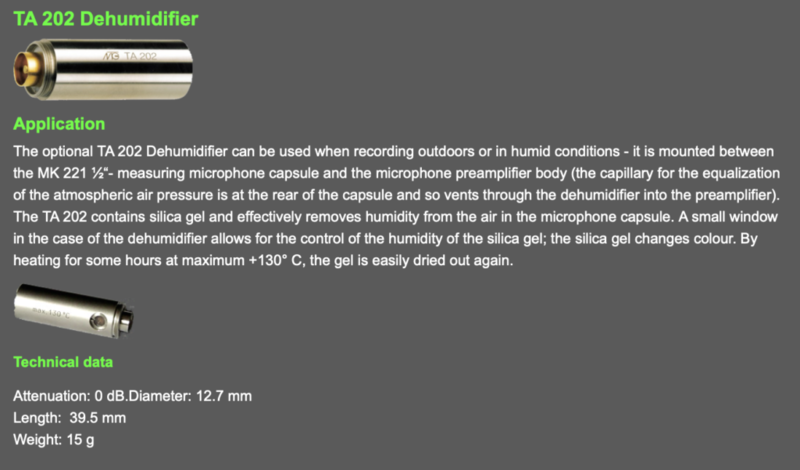 Therefore the humidity adaptor TA 202 is usable to protect the microphone in application with high air humidity. 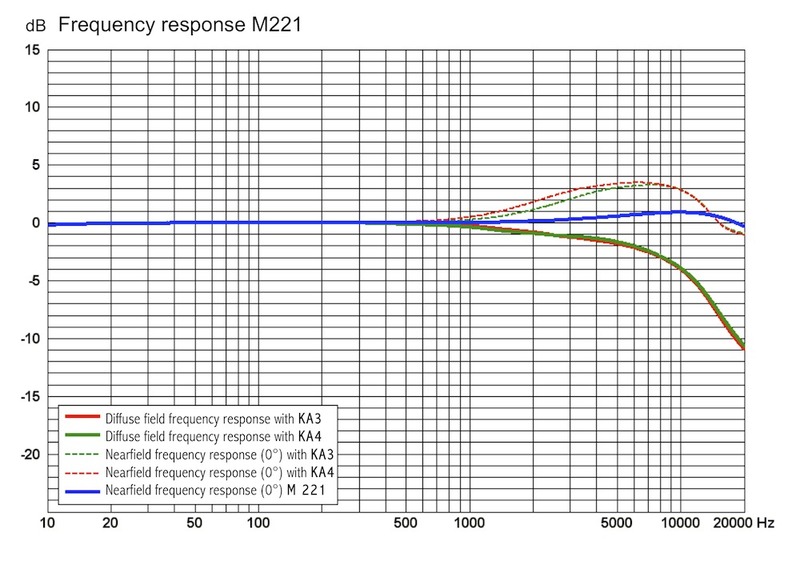 The use of the M 221 with the KA 3 APE sphere effects a frequency response accentuation which begins at approximately 1 kHz and goes constant at 3 dB from approximately 4 kHz up to 12 kHz. With the KA 4 APE sphere the accentuation of the high frequencies starts also at approximately 1 kHz and goes constant at 3 dB between 3 kHz and 12 kHz. The MK 221 is a special capsule originally developed for critical measurement applications. The microphone capsule is designed and very carefully constructed to ensure excellent long-time stability of the electroacoustical parameters. All essential components including the diaphragm are made of nickel and the diaphragm is bonded by a special galvanic process. The rear electrode is insulated from the cartridge housing by a quartz glass plate. The nickel diaphragm is actually grown in place as one uniform piece and is the same in all directions; it is just 9/10µ thick – much thinner than normal diaphragms. The transformerless circuit design of the electronic impedance converter with symmetrical output facilitates an output capability for sound pressures from15 dB(A) up to 136 dB with a maximum of 0,5 % THD (total harmonic distortion). The microphone is connected by a standard 3-pin XLR-male plug with gold-plated pins which realizes the powering by an external 48 V phantom supply according to IEC 61938 with a current consumption of 6 mA. The M 221 consists of a microphone capsule and a microphone preamplifier as independent mechanic parts which are connected to a complete microphone through a screw thread. Microphone capsule and microphone preamplifier have an identical overall diameter of 12.7 mm which enlarges to 21 mm over the length of the microphone preamplifier to the connection side of the microphone. The shape of this enlargement is designed for a minimum interference with the sound field. Microphone capsule and microphone preamplifier have together a length of 170.4 mm. On the connection side of the M 221 there are standard microphone holders mountable. To reach a higher attenuation against solid-born sound and impulses there are elastic holders and suspensions usable. The weight of the M 221 is 123 g what allows to use the microphone with stand mountings as well as to hang up the microphone from the ceiling without any problems. The M 221 can be supplied in matched stereo pairs on request – also available on request are matched sets of 3 or 5 for Decca Tree or Surround recording use.